Looking to get away from the city and to rejuvenate and relax on your very own private retreat on beautiful Salt Spring Island. Look no further! 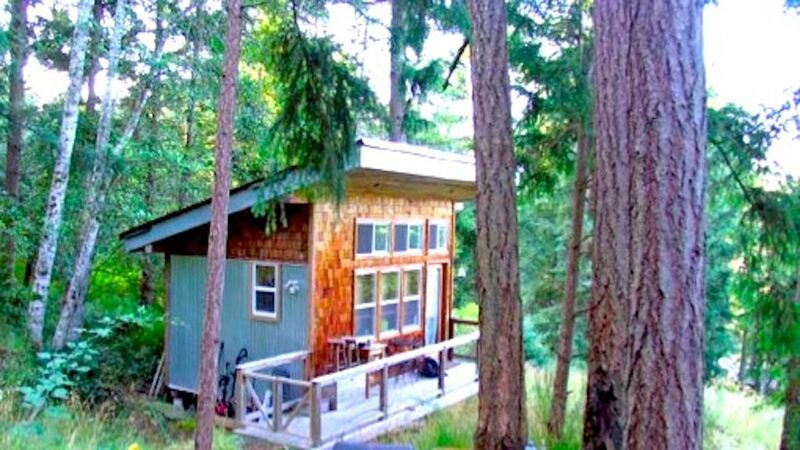 Cosy 200 square foot Sleeping Cabin PLUS mostly enclosed cedar lined 400 square foot Studio Cabana on private acreage across a country road from one of the loveliest swimming and canoeing lakes on Salt Spring Island. Perfect for a romantic getaway, a family island vacation, or a fun trip with a small group of friends. STUDIO CABANA - ONLY AVAILABLE FOR THE MONTHS OF JULY AND AUGUST - - SLEEPS 4 - A wonderful lounging space during the day that includes a covered outdoor kitchen with barbeque and hot plate. The Cabana can accommodate camping style, an additional family of 4 (two adults and two children) or 4 adults in mostly enclosed 3 walls with open views to the trees and sky. Comes with the use of a large 4 person tent. Absolutely No Parties or Events. Absolutely No Smoking. No Drugs. No Open fires. great cottage close to the lake!